Backed by a right-wing social movement, the military has defeated a democratic government in Thailand. But the red shirts will not remain dormant for long. On May 20, army General Prayuth Chan-ocha declared a state of martial law in Thailand. In the early morning hours, soldiers took up posts along streets in Bangkok, surrounded the central police station and relieved all police from duty, took over media outlets, and warned residents not to post anything volatile on social media. Initially, the general insisted it was not a coup but a response to escalating protests. Since then the army junta, now calling itself the National Council for Peace and Order, has detained the former prime minister, arrested political opponents, activists, journalists, and academics by the hundreds, and suspended Thailand’s democratic charter, dissolving parliament. Even more sobering is that General Prayuth seized power from an elected government and suspended democracy without even the temporary international flak General Sisi received after his coup in Egypt. The combination of the military leadership, ostensibly backed by the king, and a right-wing social movement that has been pushing for this for months has, for the moment, defeated a democratic government in Thailand. Thailand has been in a state of crisis since 2006, when a military coup ousted Thaksin Shinawatra, a democratically elected billionaire, who now lives in Dubai to avoid a prison sentence based on a post-coup conviction. The leaders of two competing social movements have taken turns running Thailand’s government and overthrowing it more or less since then – one side via elections backed by mass mobilization, and the other via mass mobilization backed by military coups. With reports that both sides are beginning to arm themselves, the coup may have in fact prevented civil war, for now. The two competing movements have both organized demonstrations, occupations and direct actions that have rivaled the most iconic moments of the global 21st century revolutions. One side occupied government and shopping districts in Bangkok for months in 2010, at one point setting fire to the stock exchange and the largest mall in Asia; the other side occupied and shut down both international airports in Bangkok in 2008. 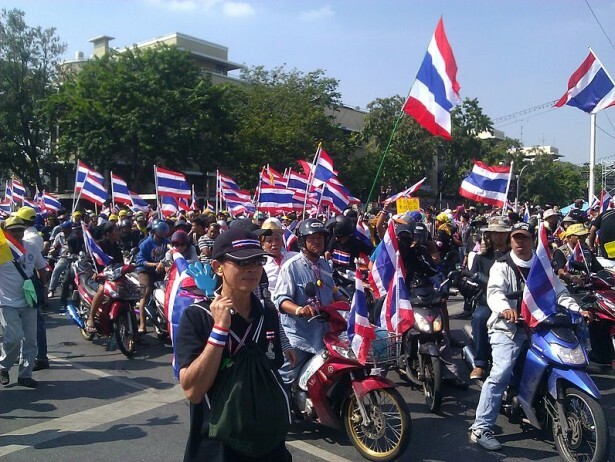 Yet discussion and analysis of the movements in Thailand is noticeably absent in United States media. One reason why Thailand may be so often neglected is the confusion generated by the unique scenario of having two powerful, popular, opposing social movements. Another complicating factor may be that neither side clearly represents the Left, a position often used as a compass to navigate a political struggle. (The “red shirts” are closer, but their singular goal is to restore the leadership of Thailand’s richest man and they completely lack prescriptive ideology.) Both of these factors make the situation in Thailand more, not less, important to understand. Despite the back-and-forth, one side has the clear electoral edge. The United Front for Democracy against Dictatorship, popularly called “red shirts,” support recently unseated Prime Minister Yingluck Shinawatra and her brother Thaksin for their policies of inexpensive healthcare, subsidies to small farmers, and other populist initiatives. The Shinawatras and their allies have consistently and decisively won elections since 2001. Their opponents, who hail largely from the Democrat Party, originally dubbed themselves “yellow shirts,” after the color of the king, conveniently distinguishing themselves from their red shirt opponents. They have since abandoned the yellow in favor of a more Thai Occupy-look— wearing the Guy Fawkes mask and waving the Thai flag — and now use the name People’s Democratic Reform Committee, or PDRC. The Democrat Party and the PDRC, despite their popularity in Bangkok and much of the tourist-centered south, have proven incapable of winning national elections. They are overwhelmingly popular in the capital city of Bangkok and some parts of the south, but there are simply too many more farmers and marginalized rural communities who back the red shirts for the PDRC to compete at the national level. Their numerical inferiority combined with their intolerance of the Shinawatra family in office has led the Democrat Party and PDRC to abandon democracy by boycotting recent elections and advocating an unelected government to rule Thailand for the time being. The new military government claims to be neutral to the red-yellow struggle, saying they took over because the two sides were unable to resolve their dispute peacefully. But the coup has realized all of the PDRC’s demands — the removal of Yingluck’s entire government, the dispersal of red shirt protesters, and a form of government not based on elections. The generals have been more sympathetic to the yellow faction all along, as evidenced by the disproportionate brutality with which they suppressed red shirt protests in 2010. By contrast, the PDRC have used more violent tactics and suffered fewer casualties at the hands of authorities. Several leaders of the PDRC were briefly detained in the wake of the most recent coup, but overall the suppression of dissent has been targeted at red shirts and their advocates. There have been small protests against the coup in Bangkok, but they have not been widespread or caused major disruptions. Prayuth has warned the army would respond to continued demonstrations with force. With most of their leadership arrested and soldiers on the streets in red shirt strongholds in central and northern Thailand, the movement has gone underground. But the supporters of Thaksin and Yingluck will not remain dormant for long, as the coup against the government they supported and harassment of their leaders will only deepen their animosity toward the military — and the middle class and elite from Bangkok they are seen as representing. The army cannot sustain a full-scale occupation of central and northern Thailand, and the red shirts will undoubtedly regroup. Coming disruptions in at least the areas north of Bangkok are inevitable, and escalations beyond simple protests and civil disobedience are also possible, ranging from rumors of a plan to set up a parallel government to the unlikely but plausible outcome of an insurrection if conditions under the military government worsen. Another reason the struggle in Thailand is so important to understand is that it is part of a global trend of the Right adopting tactics that have been assumed to be anti-authoritarian. The spontaneous, horizontal, direct action-style mass mobilizations associated with the Tunisian, Egyptian, Greek, Turkish uprisings and Occupy, tend to be associated with anti-authoritarianism, as they have most often been used to topple dictatorships and right-leaning governments. However, the strength of the tactics themselves — speed, flexibility and a feeling of ownership by all participants — are not inherently Left, and can benefit any political project. The Right appears to have learned a lesson from the 2011 uprisings and have used similar tactics with increasing success in Venezuela, Ukraine and Thailand. Of these cases, Thailand may be the most frightening, since the PRDC has simultaneously been successful and has managed, in some cases, to confuse foreign onlookers on the Left into supporting them due to their use of radical tactics and iconography. We can no longer identify allies by the tactics they use in protests, the colors and symbols they use, or even their names. Those interested in social justice must adjust to a world in which we are not only battling governments and corporations, but antithetical social movements as well, some of which look a lot like ours. Ben Case is an organizer and PhD student at the University of Pittsburgh, where he studies movement strategy and civil resistance. He is a co-founder of THINK: International and Human Security and is a member of Organization for a Free Society.